We provide a more in-depth look at stages six, seven and eight. 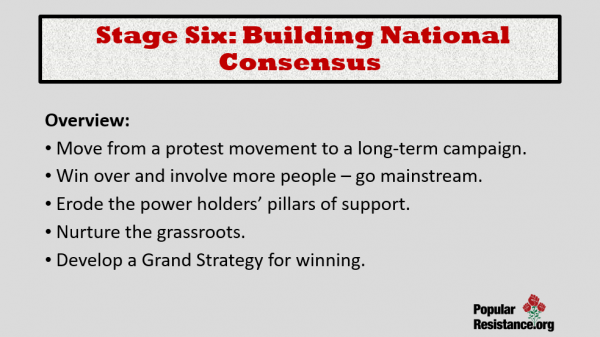 In particular, we examine the tasks and pitfalls of stage six, “Building National Consensus” and how to navigate the 12 phases, describe the mechanisms of success and what the movement does after success. The movement must consciously undergo a transformation from spontaneous protest, operating in a short-term crisis, to a long-term popular struggle to achieve positive social change. It needs to win over the neutrality, sympathies, opinions, and even support of an increasingly larger majority of the populace and involve many of them in the process of opposition and change. The central agency of opposition must slowly change from the new wave activists and groups to the great majority of nonpolitical populace, the PPOs, and the mainstream political forces as they are convinced to agree with the movement’s position. 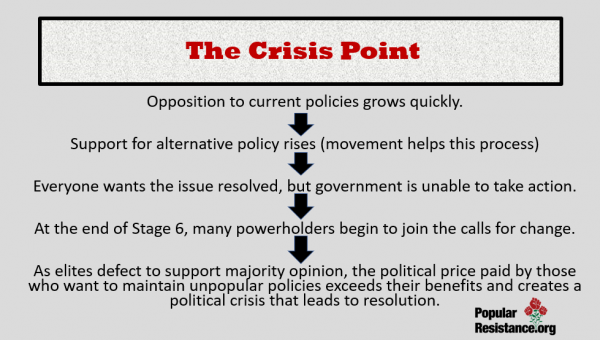 The majority stage is a long process of eroding the social, political, and economic supports that enable the powerholders to continue their policies. It is a slow process of social transformation that create a new social and political consensus, reversing those of normal times. Although movements need to organize both nationally and locally, they are only as powerful as the power of their grassroots. All the national offices in Washington, D.C., The Movement Action Plan 27 can do is “cash in” on the social and political gains created at the community level all over the country. The movement’s chief goal, therefore, is to nurture, support, and empower grassroots activists and groups. 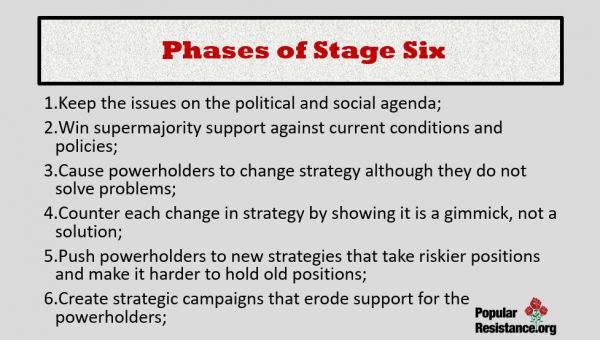 Finally, activists also need to have a grand strategy for waging Stage Six majority movements to win positive social changes against the strong opposition of the powerholders. Massive public education and conversion. The basic purpose of the movement in this stage is to educate, convert, and involve all segments of the population. This is accomplished through a broad variety of means, including the mass media. Most important, however, are direct contacts through the low-intensity activities at the local level, through sidewalk tables, demonstrations, leaflets, petitions, housemeetings, literature, and bumper stickers. The issue needs to be re-defined to show how it directly affects everyone’s values and self-interests and what they can do about it. Build a broad-based pluralized movement. The movement needs to include all segments of the population through coalitions, networks, co-sponsorship of events and petitions, and directly involving all constituency groups, example, unemployed, Blacks, workers, teachers, Hispanics, religious, women, students, etc. This includes movement organizations within each constituency such as Women for Peace and Teachers for Social Responsibility. In addition, the movement needs groups in all three categories—professional opposition organizations, new wave grassroots, and principled dissent. The different movement organizations must be allies with each other, overcoming the tendency towards self-righteousness, ani-mousity, and divisiveness. Renewed use of mainstream political and social institutions. As the movement wins larger majorities of public opinion, mainstream channels (e.g., Congress, city councils, officials, election campaigns, candidates, courts, official commissions and hearings, and ballot referenda) are used with increasing effectiveness. While they serve to build the movement—keeping the issue in the public spotlight, educating the public, and so on—they also win actual victories on demands where there is big public support in places where the movement is strongest and the central powerholders weakest, often at the local and state levels. These successes serve to build the movement’s success from the ground up over the coming years. For example, the opposition to U.S. direct military invasion of Nicaragua has been (at least temporarily) successful at the Congressional level, but not at the central powerholder level of the Reagan administration. And nuclear energy plans have been halted at the local and state levels, while the central government and nuclear industry maintain their policies favoring increased use of nuclear power. Also, the opposition to nuclear weapons has been built into a national consensus, which is putting enormous pressure on the national government. Even President Reagan has tried to appear to be ending nuclear weapons, especially U.S. missiles in Europe, where there is overwhelming public opposition. Nonviolent rallies, demonstrations, and campaigns, especially at critical times and places. Although the movement now includes a wide range of programs, it must continue to have nonviolent actions, rallies, and campaigns, with occasional civil disobedience. While nonviolent actions should be held at traditional times and places, such as on Hiroshima and Nagasaki days, they should also occur at critical times and places, such as when Congress votes on aid to the contras, when dictators visit, and during re-trigger events, such as the Chernobyl accident. Because people are involved in so many different programs in this stage, and many no longer see the purpose of some nonviolent actions, the numbers participating in any specific national or local demonstration usually drop below those of the take-off stage (with the exception of some new crises). However, because there are nonviolent actions happening in hundreds of local communities around the country when movements are in the majority stage, the nationwide total number participating in demonstrations actually increases enormously in this stage.Although nonviolent actions sometimes do help win immediate successes, such as change a city council member’s or Congressperson’s vote, their chief purpose is to help achieve many of the goals of Stages Four to Six, such as keeping the issue in the public spotlight and providing a platform for the movement to educate the public. Citizen involvement programs. The movement needs to develop programs in which large numbers of common citizens can become actively involved in programs that challenge current traditions, policies, and laws, while simultaneously carrying out the society’s values and the movement’s alternatives. This empowers the movement and citizens because they can carry out their values and goals without waiting for the powerholders to make the decision for them. This is quite different form isolated alternative “demonstration” projects. Citizen involvement programs put large numbers of people directly in contradiction with official policies. Some excellent massive citizen involvement programs of today’s movements include the sanctuary movement, in which local churches and towns throughout the country provide official sanctuary for Central American political refugees; the thousands of “citizen diplomats” traveling to Russia and Nicaragua; sending tools and aid to Nicaragua in violation of U.S. sanctions; and nuclear free towns, counties, and even countries, such as New Zealand and Palau. These programs educate and convert the public, demonstrate the alternative values and policies sought, demonstrate the extent of popular opposition, undercut the authority of the powerholders to carry out their policy goals, and build change from the bottom up. Movement organizations must switch from the “loose” to the “empowerment” model. The loose organization model was highly appropriate at the beginning of the new movement. It allowed for creative, spontaneous activities, which included civil disobedience and quick, flexible, and direct decision-making by all involved. But after six months the loose structure rapidly becomes a liability. It becomes too inefficient, people burn out from long meetings, the most experienced and strongest activists become dominant leaders, new people have difficulty becoming full participants, and the whole organization evolves into a informal hierarchy. 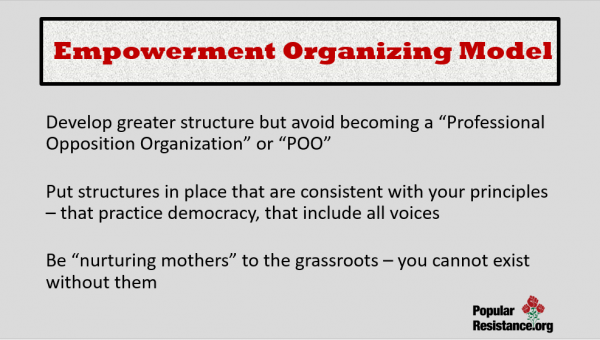 The empowerment organization model is the name given to a new structure that activists must construct themselves, in which they try to maximize the advantages and minimize the disadvantages of the hierarchical and loose models. Its goal is to be participatory democratic, efficient, flexible, and capable of lasting over the long haul. This requires more structures, but structures that assure these principles. This is a critical time for the offices and staff of national movement organizations. While they need to advocate practical policies of “real politics”, maintain the organization, and operate in bureaucracies (no matter how “collective”), they must prevent the organization from becoming a new POO, and the staff from becoming new movement elites. The primary goal is to serve, nurture, and empower the grassroots and to ensure that internal participatory democracy is carried out. The staff model must continue to be that of nurturing mothers, not dominant patriarchs. When the national staff behaves as if they are the movement, the grassroots dries up and the movement loses its power. Keep the issue in the public spotlight and on society’s agenda over time. Keep the policies and conditions which violate the values, interests, and beliefs of the majority of the populace in the public spotlight. Over time, this helps build the social and political conditions for change because it helps fulfill Robert Jay Lifton’s view that the way to get rid of a social delusion is to keep telling the truth. The present social movements against nuclear weapons and in opposition to U.S. intervention in Central America should recognize as tremendous success the fact that these issues have been kept in the public spotlight and on society’s social and political agendas for a number of years. 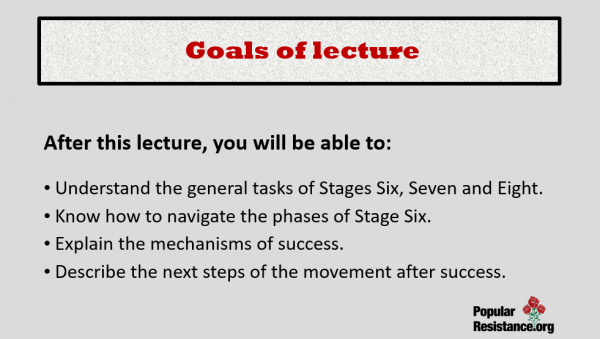 Identify all of the movement’s key goals and identify which stage each is in and develop strategies to achieve them. Identify the movement’s full range of demands, from the very specific to the general, such as end all nuclear weapons, stop nuclear testing, stop Star Wars, and stop U.S. Euromissiles. 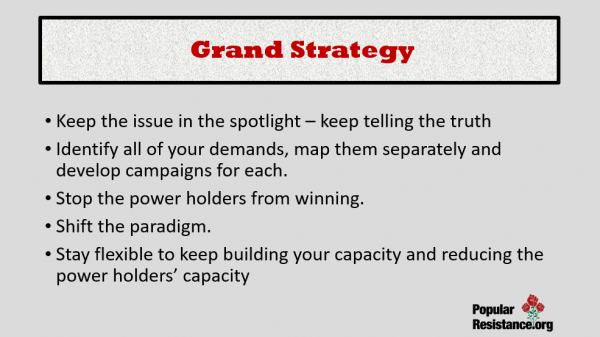 Strategies, submovements, and campaigns need to be developed for each of these major demands. 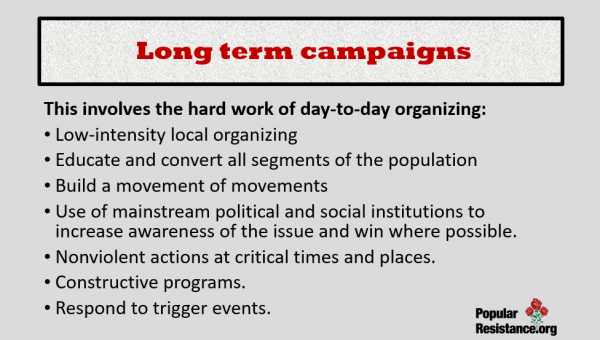 Activists should identify which MAP stage the movement is in for each of these demands and develop strategies, submovements, and campaigns to achieve each major demand. 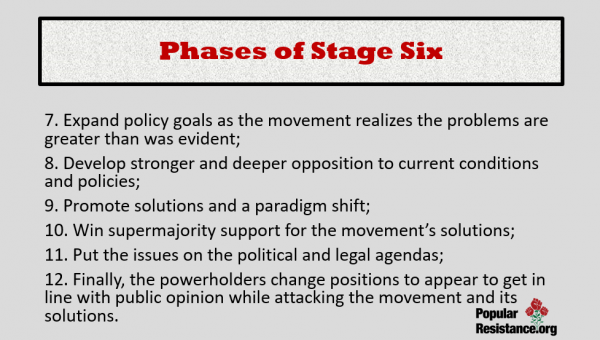 For example, stop U.S. direct invasion of Nicaragua might be in Stage Seven, official support for the contras in Stage Six, and a positive Contadora peace resolution for all of Central America is possibly just in Stage Three. Counter the powerholders’ strategy. The movement needs to identify the powerholders’ long-term goals, strategies, and programs and develop counterstrategies against each one. For example, the U.S. is considering invading Nicaragua, supporting the contra’s war against Nicaragua, preventing a meaningful peaceful Contadora resolution, etc. The movement needs to develop campaigns to prevent the government’s achieving each of these objectives. Beyond reforms: propose alternatives, larger demands, and a new paradigm. The movement now needs not only to protest present policies but also to propose specific alternatives. In the process of struggle, people act their way into thinking, and they learn that the problem is much bigger than they had thought. They come to realize that their original concerns were merely symptoms of much bigger and deeper problems; consequently, the movement needs to make larger demands. This ultimately includes the necessity for a whole new worldview or paradigm. The movement against Cruise and Pershing 2 missiles in Europe, for example, realized that they needed to remove all nuclear weapons from East and West Europe. This has led a new worldview of a nuclear free East and West Europe that will become increasingly neutral and independent of the Soviet-United States superpower bloc system. Guide the movement through the dynamics of conflict with the powerholders. Waging a social movement is similar to playing chess. 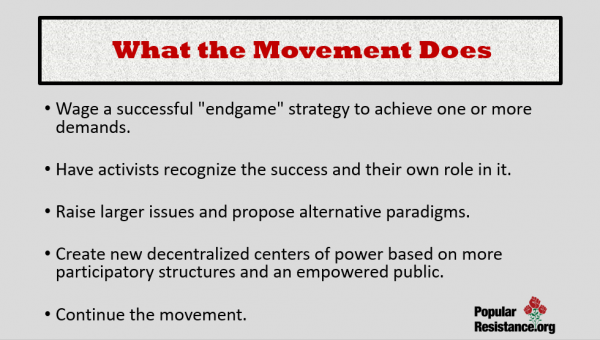 The movement and powerholders constantly engage in moves and countermoves to win the public and build conditions to support their own position. 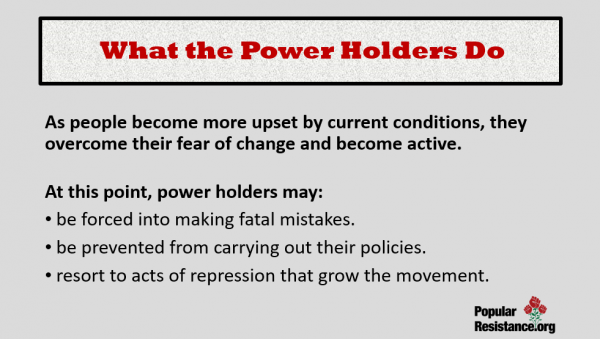 The movement tries to build moral, political, and economic conditions that will erode the support that enables the powerholders to continue their policies. The powerholders keep changing their policies to keep their capacity to maintain the status quo. The movement’s goal is to keep weakening the powerholders’ position and raising the price that they must pay to continue their policies. The Reagan administration, for example, seemed about to invade Nicaragua in 1984, but the anti-intervention movement raised public opposition to a new level. The government then switched its chief focus to supporting the contras, but the movement made this illegal by helping pass the Boland amendment, thereby forcing the government to undertake the high-risk policies of illegal and unconstitutional covert aid through Ollie North. This has weakened President Reagan’s capacity to wage his policies in Central America as well as elsewhere. Increase their counter-movement strategy to gather intelligence; discredit the movement; cause internal disruption, control, and steer the movement; preempt it by claiming to do the movement’s program (e.g., “Star Wars will end nuclear weapons”); and try to co-opt the movement under mainstream political control (e.g., co-sponsor grossly watered down Congressional bills). Publicly appear to be engaged in a meaningful “negotiation process”, while actually carrying out operative policies and doctrines without giving up any important advantages. Powerholders keep pronouncing that their policies are correct and winning. Finally, splits begin happening within the power structure, as over time pressure from the new social and political consensus force increasing portions of the mainstream political, economic and social elites to switch their position, even openly oppose the policies of the central powerholders in order to protect their own self-interests. The issue is now hotly contested within Congress, the Administration, and all other political levels. Public opinion opposing the powerholders’ policies grows to as much as 65 percent within a few years, and then, over many years, slowly swells to a large majority of up to 85 percent. The populace, however, is evenly split over wanting a change in the status quo. Half fear the alternatives more than they oppose the present conditions and policies. By the early 1970s, for example, 83 percent of Americans called for an end to the Vietnam war, and currently 65 percent oppose aid to the contras and U.S. military intervention in Central America. Keep the issue and the powerholders’ values violations in the public spotlight and on society’s agenda. Over many years, perhaps decades, public opinion against the powerholders’ policies swells to an overwhelming majority of up to 85 percent, as was opposition to the Vietnam War. Almost every sector of society eventually wants to end the problem and current policies—most politicians, the Democratic Party, celebrities, professionals, students, Middle America, youth, the unemployed, local governments, and the general population. But strangely, nothing seems to change. The problem continues, Congress seems unable to make decisive votes, and the central powerholders continue their policies, although with cosmetic changes. Moreover the movement appears to be in a lull. There are demonstrations, meetings, and activists, but they seem small, routine, and mechanical, as the movement’s position has been adopted by the mainstream of society. Over the years, however, the weight of the massive public opposition, along with the defection of many elites, eventually takes its toll. The political price that the powerholders have to pay to maintain their policies grows to become an untenable liability. Stage Seven begins when the long process of building opposition reaches a new plateau in which the new social consensus turns the tide of power against the powerholders and begins an endgame process leading to the movement’s success. 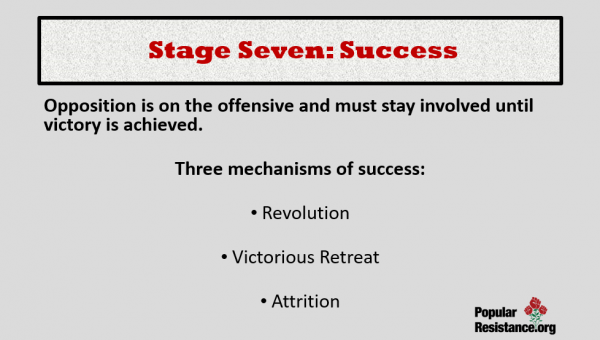 The Stage Seven process can take three forms: dramatic showdown, quiet showdown, or attrition. Quiet showdown. Realizing that they can no longer continue their present policies, the powerholders launch a face-saving endgame process of “victorious retreat”. Rather than admit defeat, they proclaim victory and start a publicly recognized process of changing their policies and conditions to those demanded by the movement and social consensus. The powerholders try to take credit for this “victory”, even though they were forced to reverse their previously hardline policies, while activists often have difficulty seeing their role in this success. A current example is President Reagan’s efforts to reach an agreement with Gorbachev to end Euromissiles. The chief engine for change switches from the “movement” to traditional progressives; the “nonpolitical” majority of the population; and mainstream political, social, and economic groups and institutions. The public becomes involved in a broad range of social actions which keep the spotlight on the issues, reveals the evils of the present policies , and creates real political and economic penalties. Most of the business and political powerholders are forced to defect from their ties to the status quo, because it is in their self-interest. The penalty for defending the status quo has become bigger than for accepting the alternative. The politicians will face hostile voters at their next election, and the business community can suffer loss of profits or business community can suffer loss of profits or business through boycotts, sanctions, and disruption of the marketplace. There sometimes is a general, worldwide insurrection which isolates the central powerholders and their dwindling support. In dramatic showdown, the movement more resembles the take-off stage, in which it plays a massive, publicly obvious role involving mass-demonstrations in a time of crisis leading to success in a relatively short time, such as the toppling of Marcos, following the election process, or the achievement of the 1965 Voting Rights Act, five months after the Selma campaign. 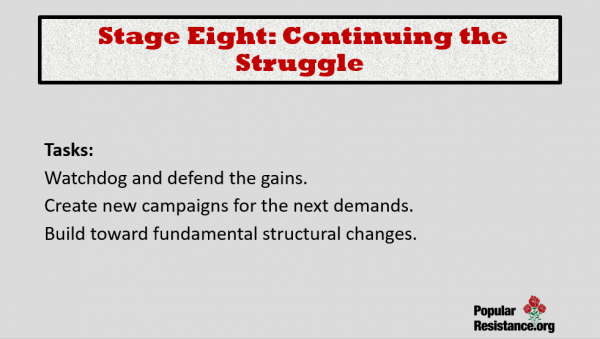 In quiet showdown, the movement continues its strategy and of both take-off and Stage Six, and while still publicly active, activists need to work hard to recognize the victory and their own role. 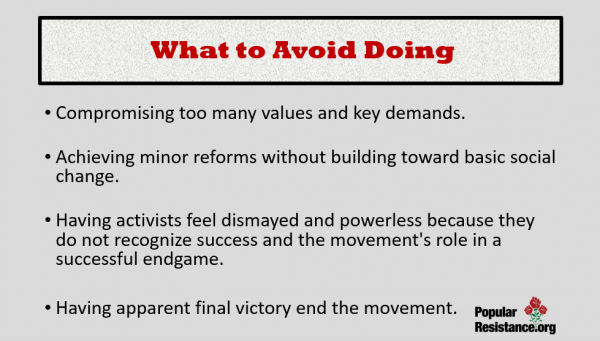 In attrition, the endgame process is often not recognized as success, the movement’s role is much less visible, and much of the opposition’s efforts are carried out through the work of elites and the POOs. Wage a successful “endgame” strategy to achieve one or more demands. Celebrate success. 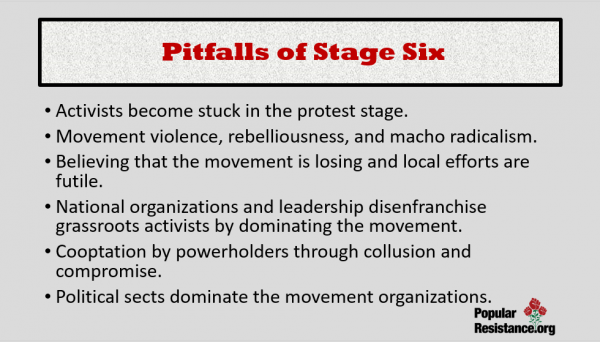 The successes of Stage Seven and the movement’s role in achieving them should be clearly recognized by activists. New social consciousness, issues, and movements. The modern student and women’s movements emerged out of the civil rights and anti-Vietnam War movements. Beyond reform to social change. 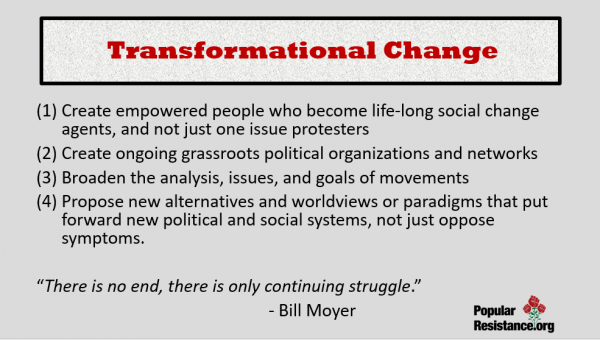 Social movements need to go beyond immediate reforms to build toward fundamental structural changes by (1) creating empowered people who become life-long social change agents, and not just one issue protesters; (2) creating ongoing grassroots political organizations and networks; (3) broadening the analysis, issues, and goals of movements; (4) propose new alternatives and worldviews or paradigms that put forward new political and social systems, not just oppose symptoms. A new social consensus of about 80 percent of the populace supports the favorable resolution of the movement’s demand and the resulting new policies and conditions. The new demands on which the movement now begins focusing are supported by between 10 and 80 percent of the public and are different MAP stages. The movement’s goals are to assure that the demands achieved are maintained and to circle back to focus the movement on other demands. Peoples’ movements move the world further along the path towards more fully meeting the spiritual, physical, social, and political needs of humanity. Moreover, the very process of being fully involved in the struggle of peoples’ movements contributes to peoples’ political and spiritual fulfillment. Activists are part of the emerging people-power movements around the world. People worldwide are struggling to transform themselves and the world from the present era of superpowers, materialism, environmental breakdown, disenfranchisement, abject poverty amidst opulence, and militarism, to a new, more human era of democracy, freedom, justice, self-determination, human rights, peaceful coexistence, preservation of the environment, and the meeting of basic human needs. Consequently, the long-term impacts are more important than their immediate successes. The civil rights movement, for example, created a new positive image of Blacks among themselves and whites, established nonviolent action as a means to achieve people power, directly spun off the student and anti-Vietnam War movements, and inspired peoples’ movements got the American people, for the first time, to challenge and change American foreign policy and created the “Vietnam syndrome” in which the American people oppose the century old policy of U.S. military intervention in Latin America to achieve the interests of American powerholders. Social movements are also contagious: Philippines people’s movement spurred similar efforts in Haiti, Chile, and now South Korea.